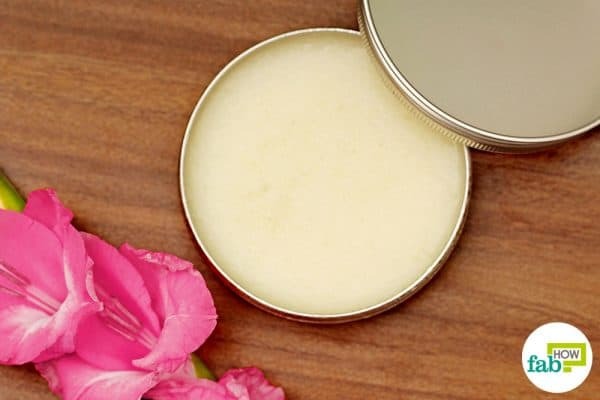 Body butters, scrubs and lotions – your dressing area is probably decked up with all sorts of products to help keep your skin healthy and glowing. Wouldn’t you readily trade them all for one single natural ingredient that can help with all your skin care needs? 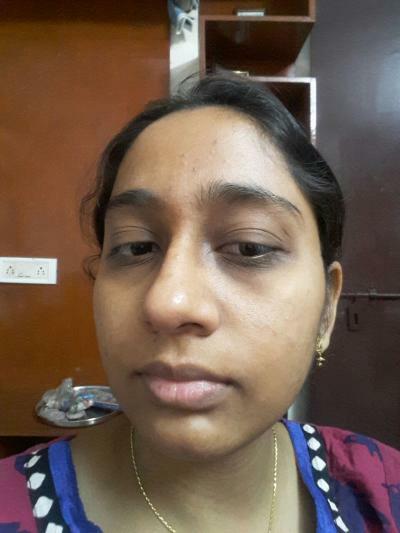 The pollution and impurities in the air are particularly harsh on one’s skin. But the ample amount of chemicals in those products that you use may be even worse. Anti-aging creams, glow packs, sunscreens and a variety of other products pose twice the threat to your skin. The largest organ in the body, your skin is both sturdy and yet delicate. 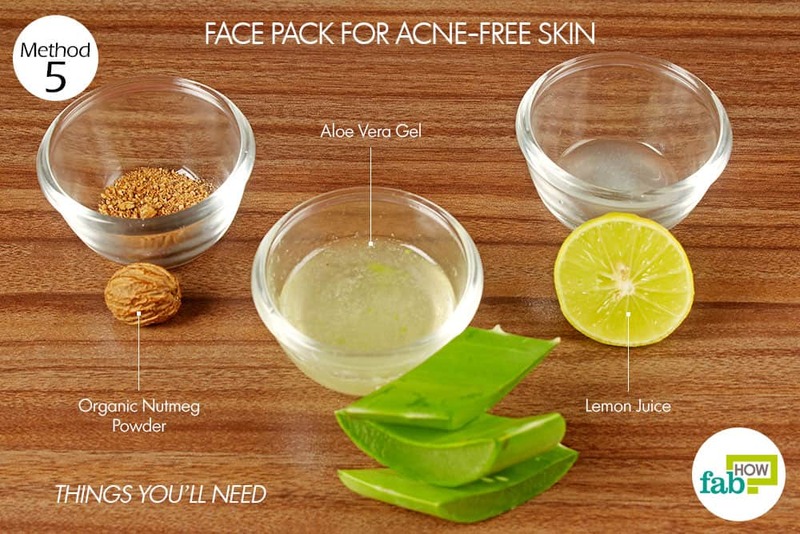 Aloe vera is that one gift of nature that’s capable of catering to a plethora of your skin’s needs. 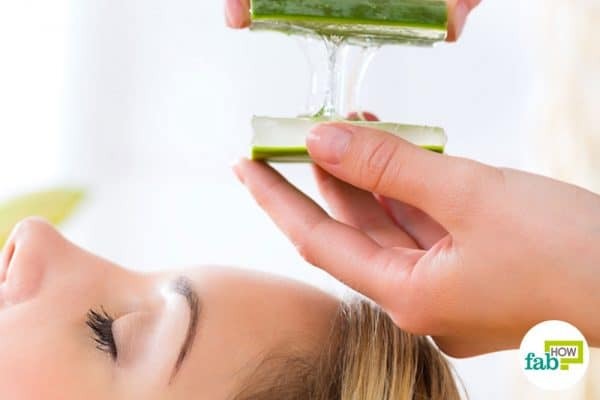 Hailed as Cleopatra’s beauty secret, Alexander’s healing secret, the green power of the Romans and Greeks, aloe vera is now known as the multi-purpose medicinal solution of people in India, China and increasingly across the globe. 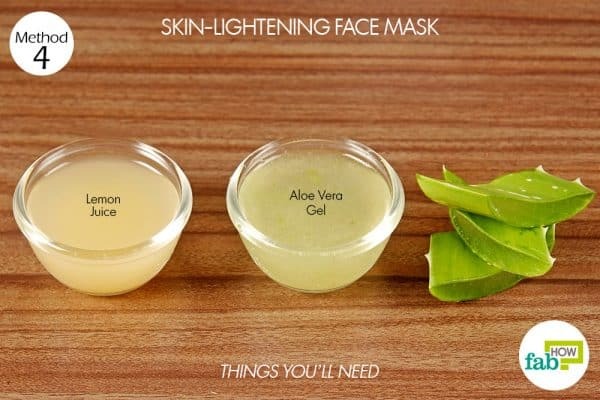 You can use aloe vera to get clear, glowing and spotless skin. Aloe vera is a thick, short-stemmed plant that stores water in its leaves, which grow to about 12 to 19 inches in length. The slimy substance in the leaves is the gel that we often associate with aloe vera products. This gel contains multiple bioactive compounds, including vitamins, minerals, amino acids and antioxidants that are exceptionally good for the health of your skin. 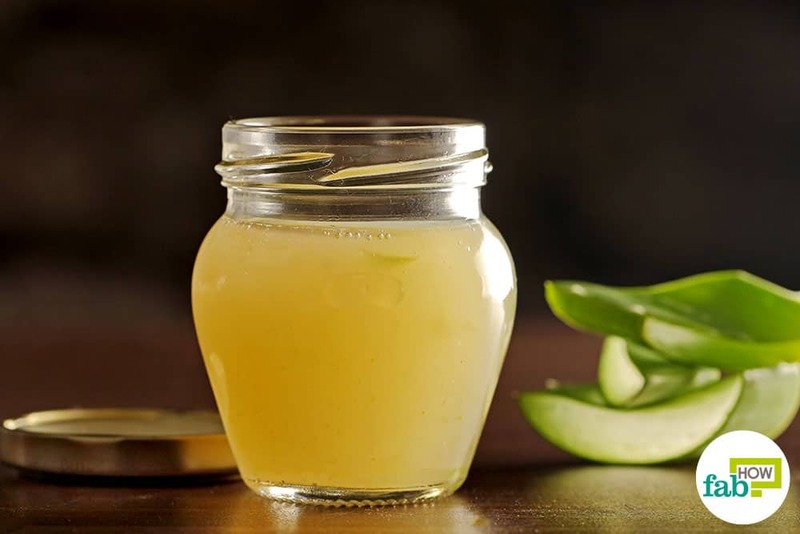 Aloe vera gel also contains two hormones, namely auxin and gibberellins, which promote healing and contain anti-inflammatory properties to reduce inflammation. Moreover, aloe vera forms a powerful protective layer on the skin and seals in moisture, which further helps keep skin troubles at bay. The nutritional qualities and antioxidant properties of aloe vera make it exceptionally good for providing lasting moisture to the skin. It also has antimicrobial properties that help eliminate harmful pathogens from the skin, and anti-inflammatory and other components that help deal with acne, fine lines and wrinkles, spots, freckles and blemishes. 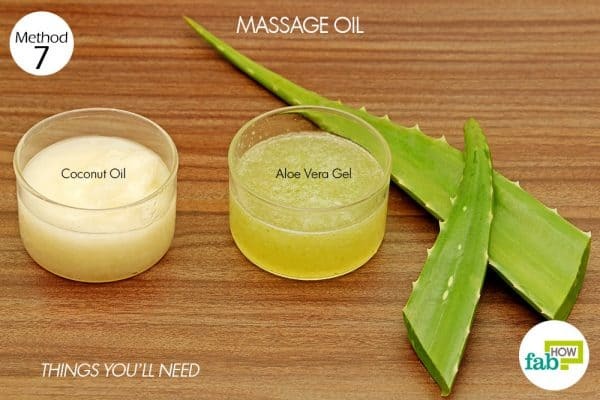 Not only this, aloe vera is incredibly good for your hair, too! So, dump the toxic skin care products on your vanity and use the all-natural aloe vera for softer, younger and healthier skin. Rough, uneven skin with acne, blackheads and clogged pores prompts you to buy bucket loads of face washes that seem unable to protect your skin from the everyday and harsh environmental conditions. 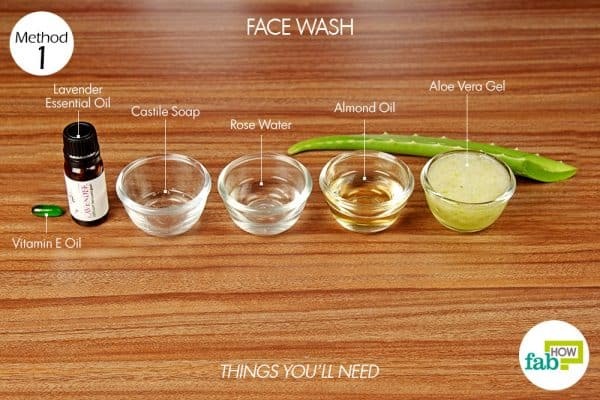 But a homemade face wash made with aloe vera can take care of that. It will seal essential nutrients and moisture into your skin to make it softer and healthier. 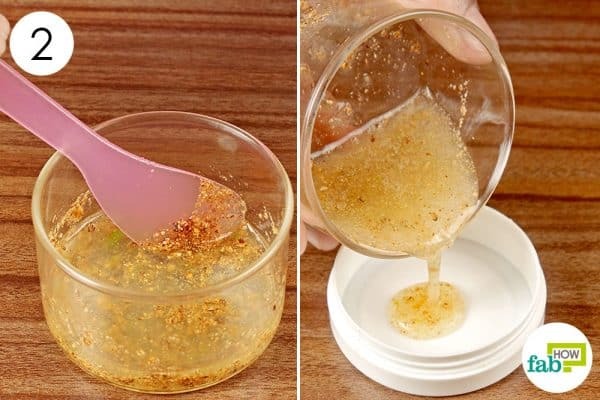 The best thing about this homemade face wash is that you can personalize the ingredients as per their suitability to your skin type and your choice of fragrance. Besides being a natural moisturizer and anti-inflammatory, aloe vera is loaded with antioxidants that promote the growth of new skin cells and fight off skin irritation and allergic reactions. In addition to aloe vera, we used rose water, castile soap, almond oil, vitamin E oil and lavender essential oil in our face wash.
Rose water is another anti-inflammatory, antiseptic and astringent that is beneficial to the skin for removing oil and dirt from the pores. While castile soap (full of saponins) acts as a natural cleanser and anti-inflammatory, almond oil is loaded with vitamins and minerals that help soothe irritation and restore the skin’s normal pH level. Vitamin E oil is another natural moisturizer, antioxidant and anti-inflammatory agent. 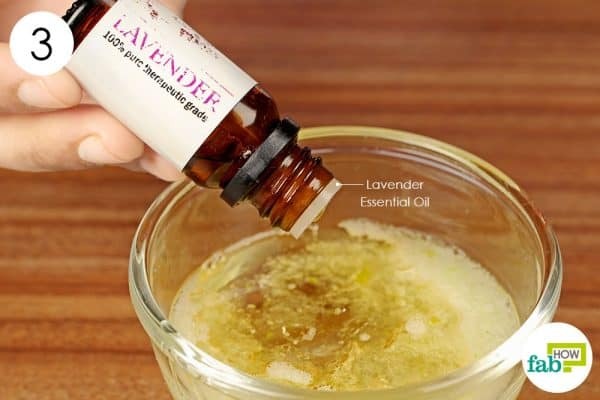 Essential oils are optional, but they add beneficial healing properties and an aroma to the face wash, so go ahead and add a few drops of your favorite essential oil. Put 2 tablespoons of aloe vera gel in a bowl. Add 1 tablespoon of almond oil, followed by 1 tablespoon of rose water. Add 2 teaspoons castile soap as well. Puncture a vitamin E capsule to extract the oil. Squirt 2 or 3 drops of the oil into the mixture. Scent the mixture with 3 or 4 drops of your favorite essential oil. We used lavender essential oil for its excellent aroma and antiseptic, antibacterial, anti-inflammatory and soothing properties. Tea tree essential oil and orange essential oils are also great choices for aroma and skin benefits. Grab a hand whisk and whip the ingredients together to mix them well. Pour the solution into a bottle for storage. 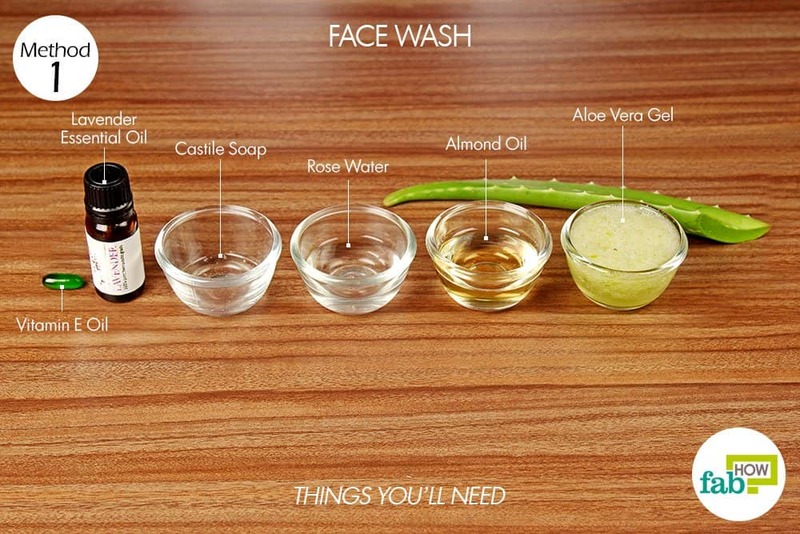 Use the aloe vera face wash each day in the morning and evening for clear, soft and healthy skin. Apply 2 or 3 drops of the solution on your face. Rub it around in circles for 30 to 60 seconds, then wash it off with lukewarm water. 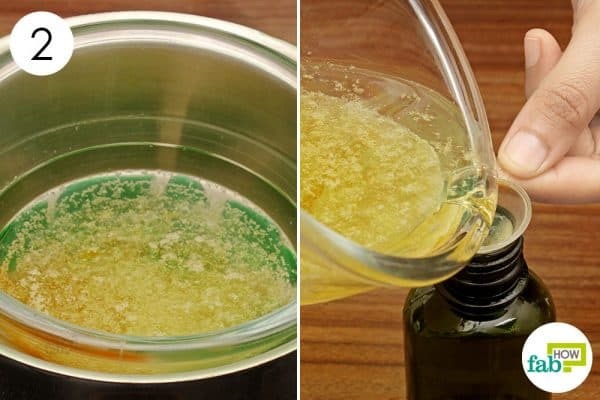 This homemade face wash will keep for 4 to 6 weeks. The water and oil may separate, so shake it well before each use. 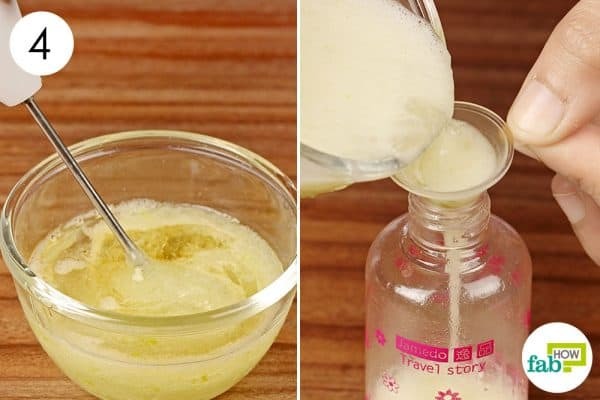 This homemade face moisturizer is made with aloe vera gel, coconut oil, shea butter, vitamin E oil, almond oil and essential oils – all of which are incredibly good for your skin’s health. Both aloe vera and coconut oil boast of natural moisturizing, hydrating and healing properties that help eliminate harmful pathogens from the skin. Shea butter is called a superfood for the skin, due to its constituents like unsaturated fats, essential fatty acids, vitamins E and D, and pro-vitamins. Due to the presence of multiple vitamins (A, B, D and E), proteins, essential minerals, fats and antioxidants, almond oil and vitamin E oil are exceptionally good for wrinkles, acne, scars and fine lines. 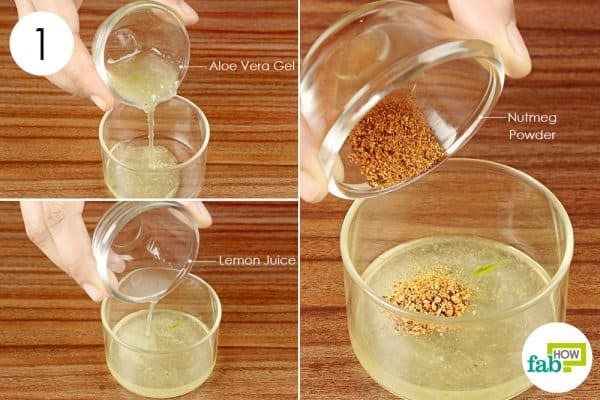 Place 2 to 3 tablespoons of aloe vera gel in a bowl. Add ½ tablespoon of shea butter to the aloe vera gel. 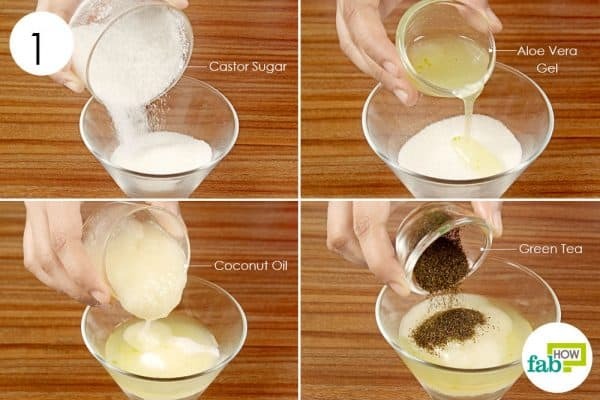 Pour 1 tablespoon each of coconut and almond oils into the mixture. 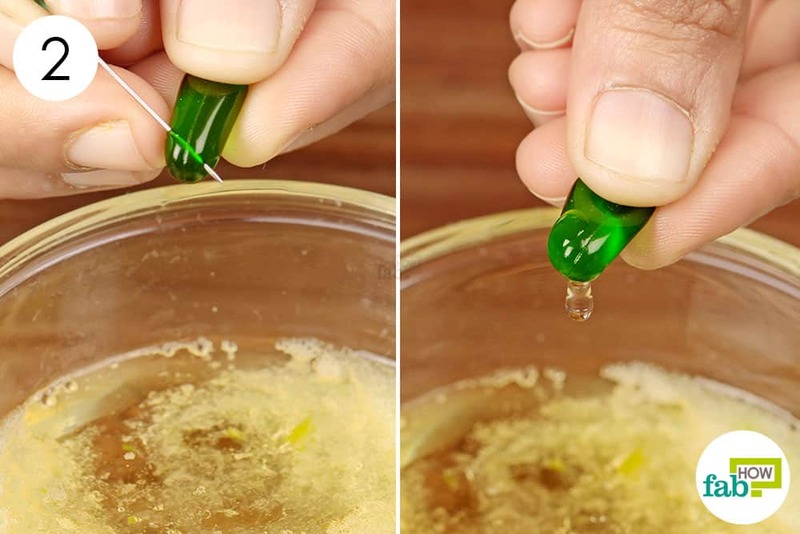 Puncture a vitamin E capsule and squirt 2 or 3 drops of the oil into the mixture. Finish with 2 or 3 drops of your preferred essential oil. Whisk the mixture until the ingredients thoroughly incorporate into each other. 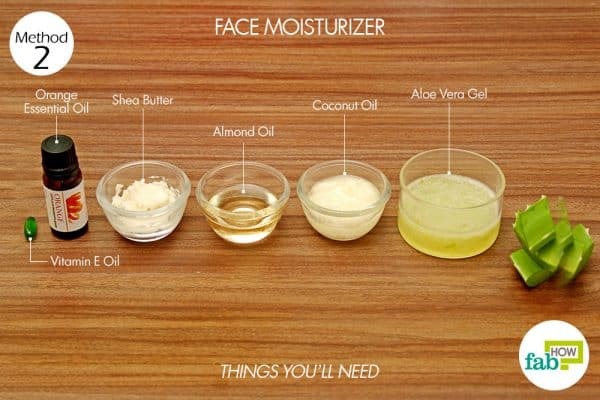 Pour the moisturizer into a container of your choice. 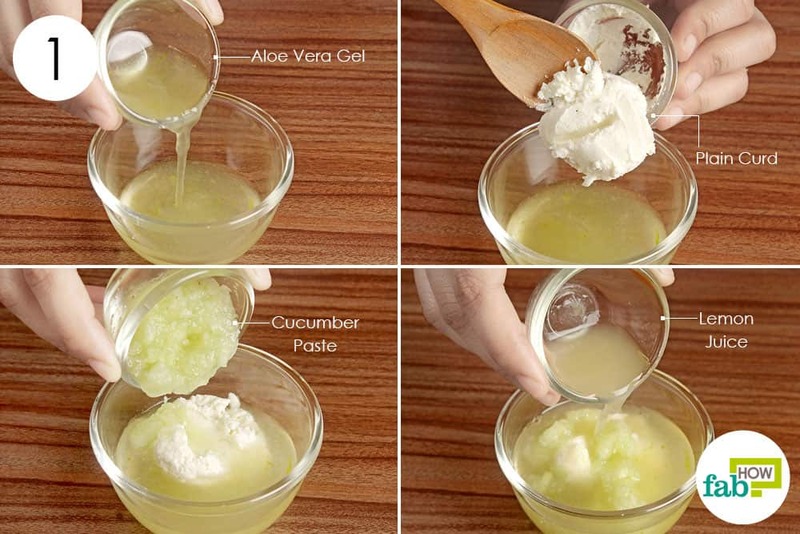 Apply this DIY aloe vera moisturizer each night before going to bed for softer, healthier and glowing skin. 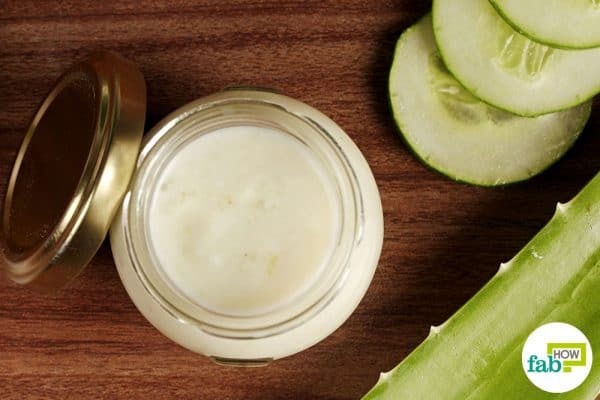 Aloe vera, curd, cucumber and lemon work as an excellent combination of ingredients to lighten the pigmentation on your skin and clear up a suntan. 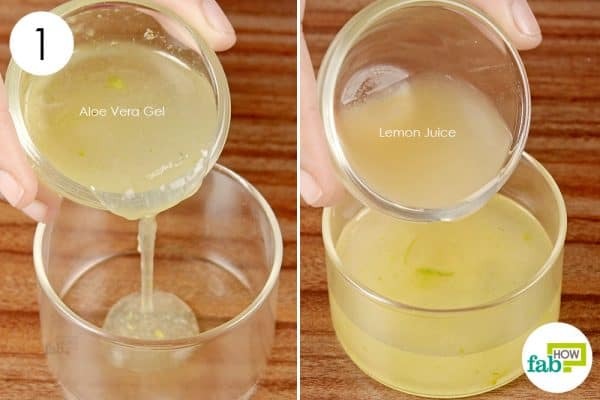 While lemon juice offers natural cleansing and bleaching benefits, aloe vera juice helps lighten the skin color and exfoliates the dead and damaged cells. 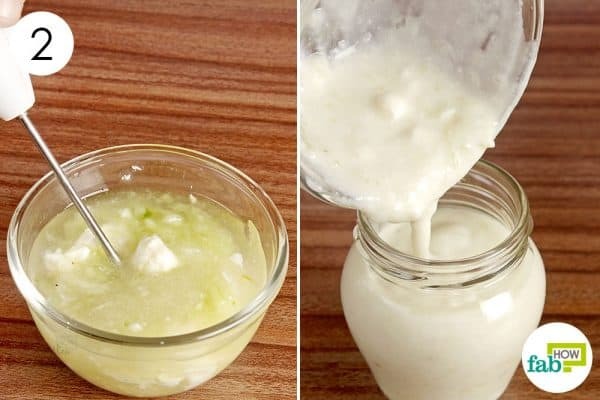 The lactic acid present in curd gives it mild bleaching properties that also help lighten the skin. Cucumber helps cool and soothe the skin, while reducing any symptoms of itching, redness or irritation. Pour 2 tablespoons of aloe vera gel into a bowl. Add 1 tablespoon of plain curd. Extract and add 1 tablespoon of cucumber paste, followed by 1 tablespoon of lemon juice. Whisk the ingredients together to form a creamy mask. Pour the mask into a container of your choice. You can store it in the refrigerator for up to 30 days. 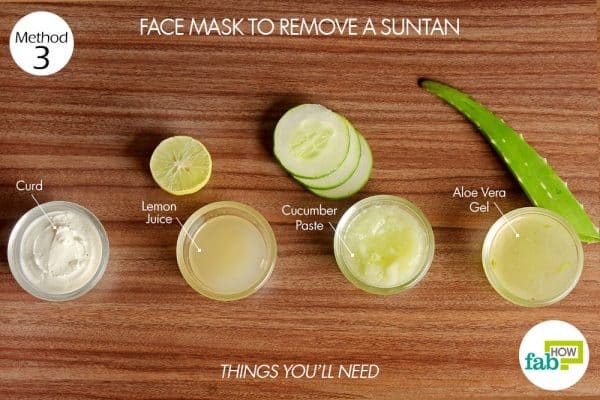 Smear the aloe vera mask liberally over the suntanned areas. Allow it to dry for 30 minutes before rinsing it off with lukewarm water. Repeat the aloe vera suntan treatment once each day for excellent results. 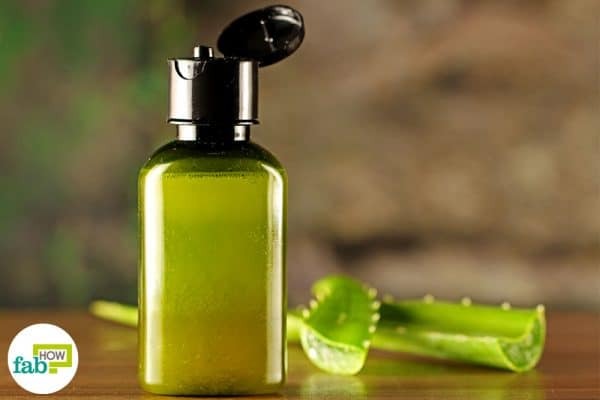 For those with sensitive skin who just can’t handle any and every remedy flooding the Internet, aloe vera will help you obtain incredible results. Long known for its healing, hydrating, skin-lightening and toning properties, aloe vera gel is a naturally occurring substance that works wonders on your skin. An incredible moisturizer, antioxidant, anti-inflammatory, antimicrobial and healer, aloe vera keeps your skin fresh and blemish-free. Aloe vera along with lemon juice forms a powerful combination for the skin. An excellent source of citric acid, lemon juice works as natural bleach and a powerful astringent to lighten discolorations and restore the skin’s pH balance. 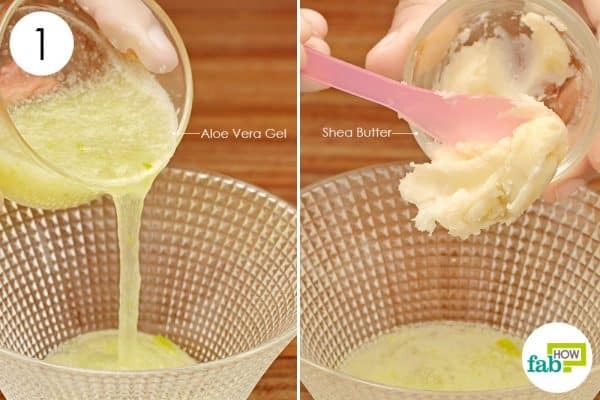 Put 2 tablespoons of aloe vera gel in a small bowl. Add an equal amount of lemon juice to it. Whisk the mixture for about 1 minute to mix the ingredients thoroughly. Transfer the homemade face mask to an airtight container. You can store it in the refrigerator for up to 4 weeks. Use it as you would normally use a face mask. 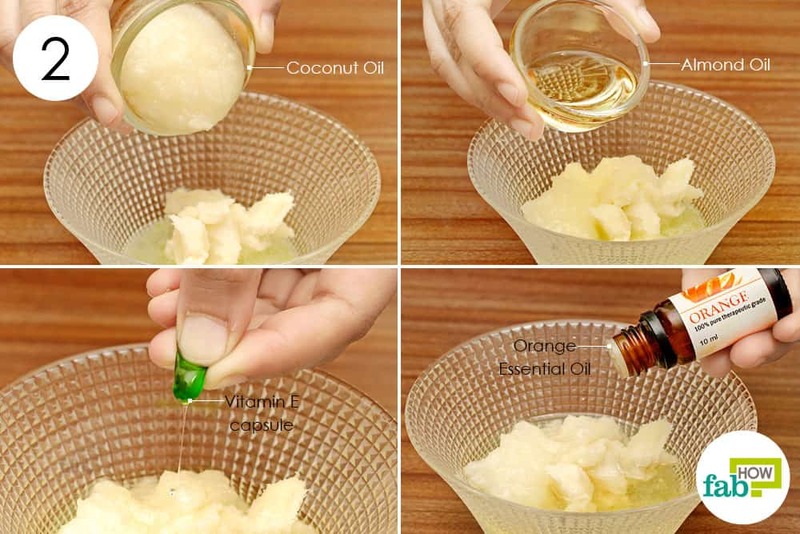 Put a small amount on your palm and apply it evenly on your face and neck. 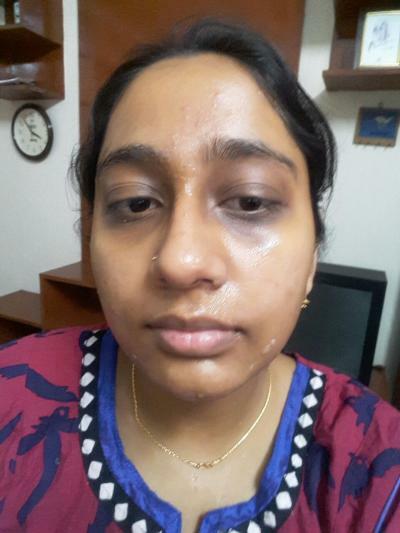 This skin lightening aloe vera face mask can be applied twice a week for a month or till you achieve the desired results. An antimicrobial, aloe vera is loaded with healing properties that help soothe irritated skin. It not only cures acne but also helps prevent scarring and future breakouts. Nutmeg, which has antiviral and antibacterial properties, serves as an ideal ingredient to treat skin infections, clear up clogged pores and control excess oil in the skin. In particular, nutmeg is extremely powerful against cystic acne. 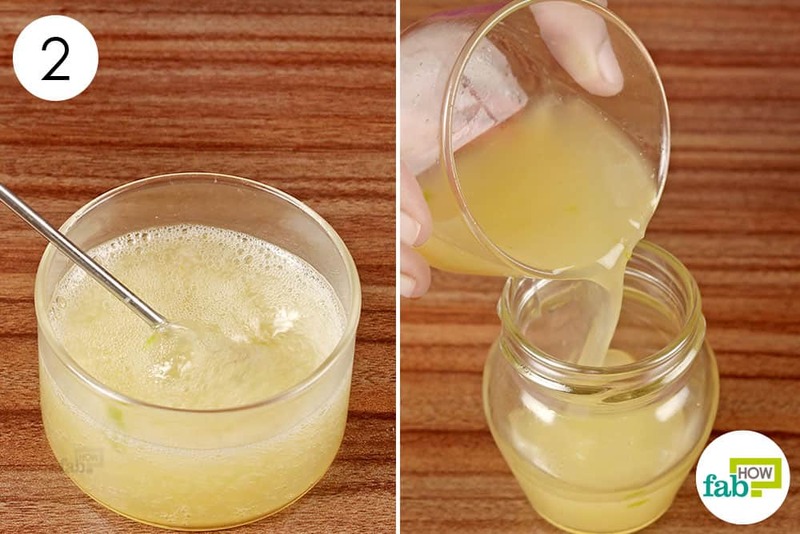 Natural bleach, lemon juice has skin-lightening properties that help reduce dark spots and marks on the skin. 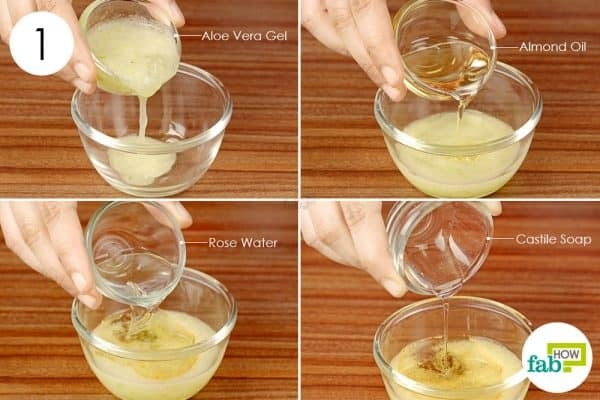 Pour 2 teaspoons of aloe vera gel into a bowl. Add ½ teaspoon of lemon juice to it. Finish by adding ¼ teaspoon of nutmeg powder. 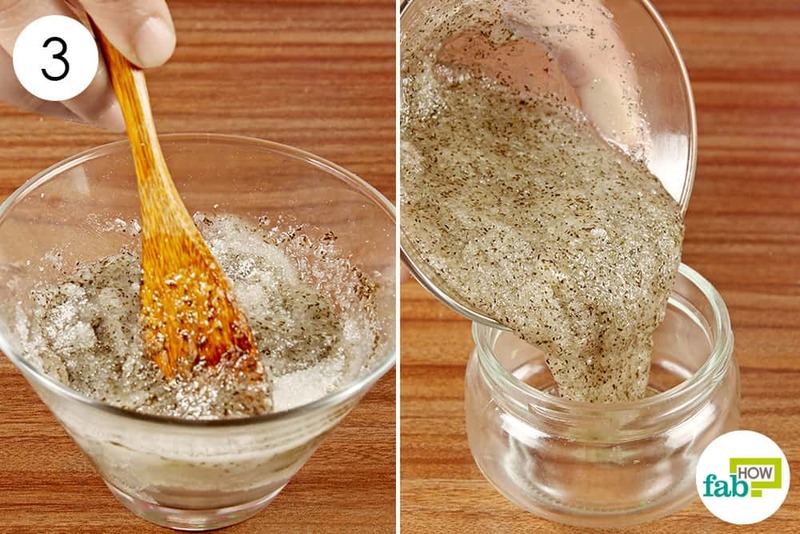 Pour the mixture into a container of your choice for storing. Apply the pack evenly on your face. Leave it on for 20 minutes before rinsing it off with normal water. Use the aloe vera pack twice a week for acne-free, soft and healthy skin. 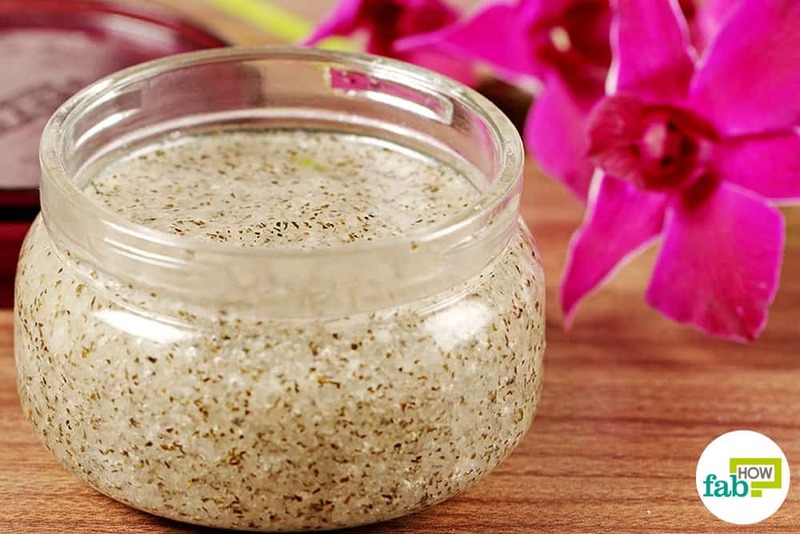 For any skin care regime, exfoliation is one of the most important components. Exfoliation clears away dead skin cells and unclogs the pores, thus allowing your skin to breathe properly. Well-exfoliated skin also absorbs and retains moisture and nutrients more readily. 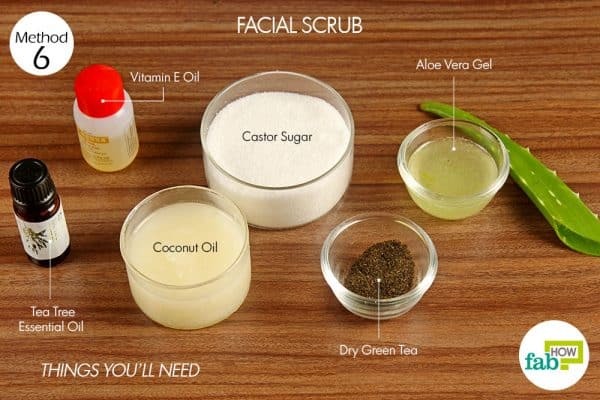 Ideally, a healthy skin care regime calls for the proper coordination of exfoliating and moisturizing your skin. 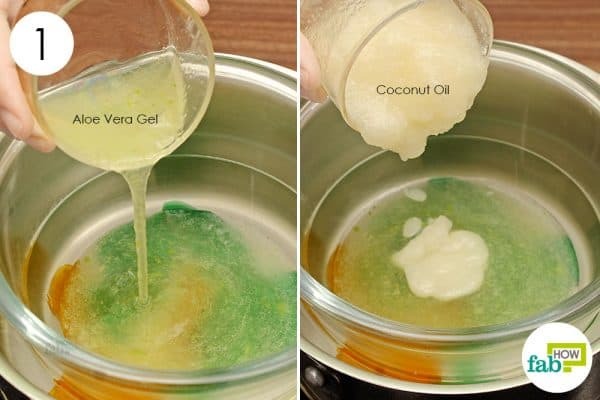 A simple combination of sugar, aloe vera and coconut oil is just the way to do that! While aloe vera and coconut oil have hydrating and moisturizing properties, sugar acts as an incredible exfoliating agent. What’s more, you can customize your scrub with the ingredients of your choice. For example, for intense aroma and benefits, you may add your own choice of essential oils and herbs. 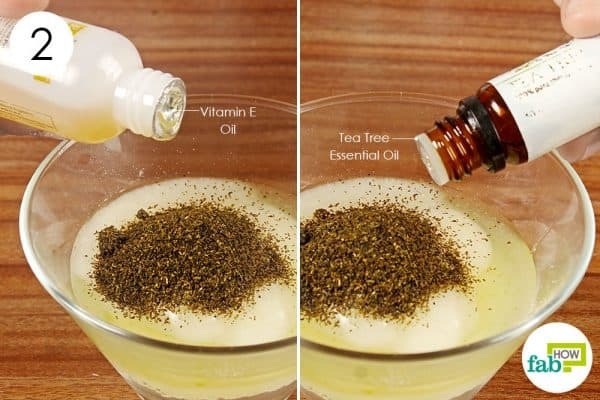 We used tea tree essential oil that works great for acne and green tea that is loaded with antioxidants. You may incorporate any other ingredient of your choice. Start with ½ cup of castor sugar in a bowl. Pour 1 tablespoon of aloe vera gel into the bowl. Blend in 2 tablespoons of coconut oil, followed by 2 teaspoons of dried green tea. Squirt in 3 or 4 drops of vitamin E oil. Finally, add 5 or 6 drops of tea tree essential oil to the mixture. For enhanced aroma and benefits, you may also add a few drops of any other essential oil of your choice. Pour it into a plastic or glass container for storage. You can store the scrub for up to 2 months. Use the scrub twice a week for soft, supple and nourished skin. 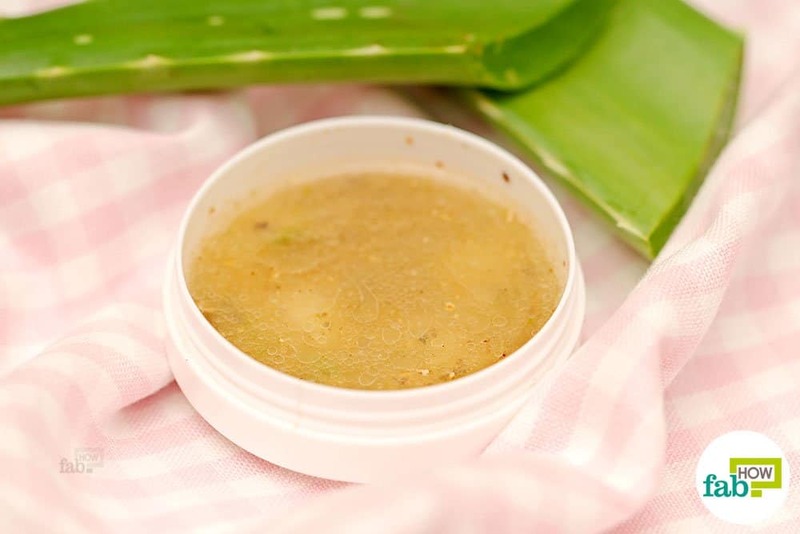 Apply the aloe vera scrub, gently massaging and rubbing it around on your skin to remove dead skin cells. Allow it to sit for 7 to 8 minutes before rinsing it off with cold water. You don’t need to apply a moisturizer after using the scrub, as it contains ample coconut oil to nourish and moisturize your skin. Massaging your skin is probably one of the easiest and most effective means of tackling all skin troubles. A gentle massage with oil supplies necessary nutrients to the skin and also promotes proper blood circulation. While coconut, olive and castor oil are among the most preferred oils for skin, coconut oil is considered the magic formula for soft, supple and healthy skin. Its nourishing, moisturizing and hydrating properties help fulfill the skin’s nutritional requirements. Adding aloe vera to the coconut oil boosts the benefits of this natural skin treatment. The presence of amino acids, folic acid, vitamins A and C, and multiple enzymes makes aloe vera a panacea for all your skin troubles. The combination also works to restore the skin’s pH balance. 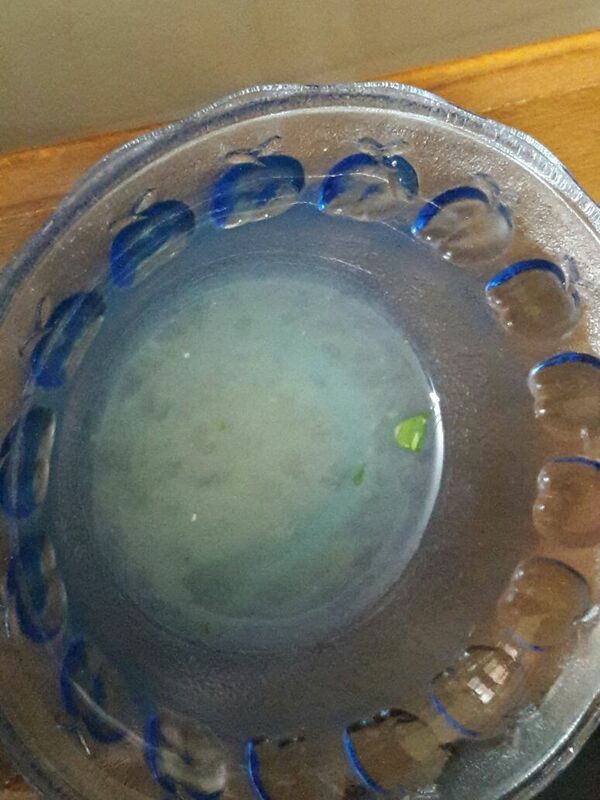 Pour ½ cup of fresh aloe vera gel into the bowl. Add ½ cup of coconut oil to it. Heat the ingredients on medium heat for 15 minutes. 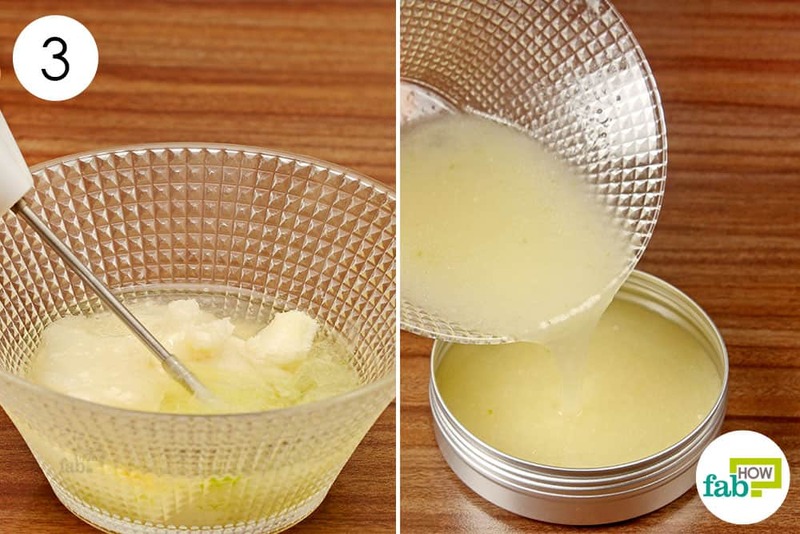 Keep stirring occasionally until the coconut oil melts completely and mixes well with the aloe vera gel. Pour the oil blend into a dark bottle and store it in the refrigerator. Massage the aloe vera oil blend into the skin each night before going to bed. Leave it overnight and wash it off the next morning with water. Repeat each night for soft and healthy skin. You may add 2 or 3 drops of your favorite essential oil for added benefits and aroma. Aloe vera suits most skin types, but do a spot test before using any of the given remedies to be sure that you’re not allergic to it. Adding some vitamin E oil in all aloe vera skin recipes can increase the shelf life. 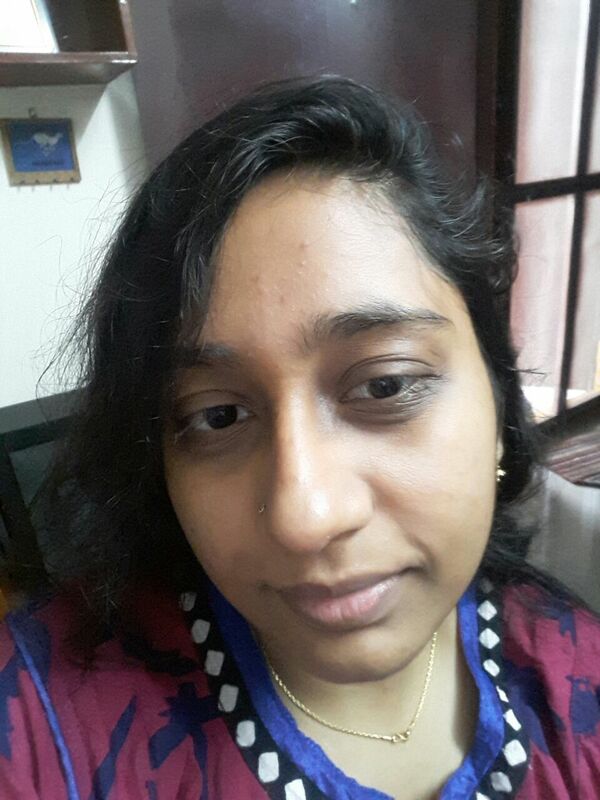 Skin-Lightening Face Mask really works wonders on your skin. You can clearly feel the difference from the first use itself. You will observe wonderful results on the long term. What’s the shelf life of the aloe Vera and rose water face wash? All natural homemade products have a short shelf life due to the absence of any preservatives and chemicals. The aloe-rose water face wash if prepared from fresh aloe vera leaves will keep good up to 3-4 weeks if stored in a cool dark place. Best is to keep it refrigerated. If you are using store-bought aloe gel, then this will keep good easily up to 6-7 months.